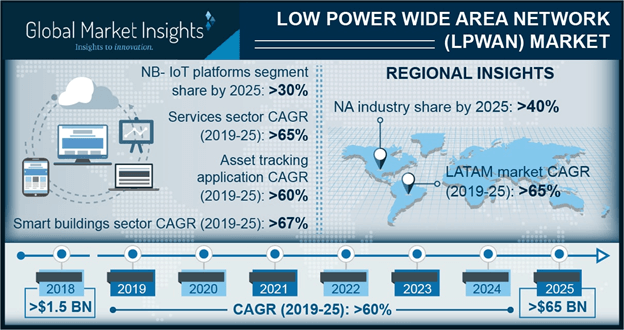 Low Power Wide Area Network (LPWAN) Market size is set to exceed USD 65 billion by 2025; according to a new research report by Global Market Insights, Inc.
For instance, the rising penetration of Industrial IoT (IIoT) in the manufacturing industry has increased the demand for LPWA technologies, particularly NB-IoT and LTE-M, to enable reliable machine-to-machine communication. Industrial IoT connections are expected to increase nearly five times between 2016 and 2025, from 2.4 billion to around 14 billion connections. By deploying LPWAN connections, manufacturing companies can increase their operational efficiencies to drive high productivity. Another factor fueling the LPWAN market growth is increasing investments by companies in LPWA technologies. For instance, in June 2017, Cisco contributed to a USD 75 million Series D funding round for Actility, a LPWAN startup. Cisco’s investments in Actility enabled it to accelerate the development of IoT solutions. The LPWAN platforms held a major market share of over 70% in 2018 owing to the deployment of various platforms, including NB-IoT, LoRaWAN, Sigfox, and LTE-M. Massive IoT deployments in various industry verticals, including utilities, manufacturing, transportation, and healthcare, has increased the demand for LPWAN platforms to support connected devices requiring low power consumption, long range, and low costs. Among all the platforms, LoRaWAN platforms held the highest market share of over 50% in 2018 as they use unlicensed spectrum and are best suited for applications that generate low traffic and require low-cost sensors. North America is expected to dominate the LPWAN market with a share of over 40% in 2025 due to smartphone penetration and advanced IoT infrastructure. Various efforts taken by market players for the deployment of LPWA technologies will also fuel low power wide area network (LPWAN) market growth. For instance, in October 2016, Semtech and Comcast entered into an agreement to deploy trial LoRaWAN network, based on Semtech’s LoRa Wireless Radio Frequency technology in the U.S. To facilitate the deployment of the network in around 30 major cities across the country, Semtech also agreed to grant Comcast a warrant to purchase shares of the company’s common stock. In October 2016, AT&T launched the first LTE-M site in San Francisco to support the company’s LPWAN pilot project at its labs in San Ramon. The pilot project also included solutions from technology providers including Ericsson, Sierra Wireless, Qualcomm, and Xirgo. Companies operating in the LPWAN market are entering into strategic partnerships and providing funds to LPWAN vendors to develop services, which are based on LPWA technologies. For instance, in September 2018, U.S. Cellular partnered with Internet of Things America LLC to sell IoT services based on LoRa, particularly to agricultural companies across its 23-state coverage areas. To support the deployment of IoT use cases, companies are launching their IoT networks based on LPWAN. For instance, in June 2017, ICondor launched its IoT network based on LoRaWAN, which leverages Semtech’s LoRa technology. Telecom companies, such as Vodafone, China Telecom, Orange, and Reliance Jio, are engaged in developing & commercializing their narrowband IoT offerings in the market.